In the video camera realm, the warning is very clear: "Protect your highlights! ", and it's common to underexpose your image for the sake of doing so. Word on the street has it that bringing your image back up from underexposure is a lot easier than bringing it down from overexposure. I never questioned this popular belief and have been following this rule of thumb, but never really saw any proof by way of analytical comparison. Taking a break from the endless number of producers beating down my door to shoot their feature... ...I put on my lab coat and goggles and plunged into the proof of the pudding. I set up my DVX-100 on a tripod square to a DSC Labs 11-step Front Box chip chart and ran a firewire cable from the camera to Final Cut Pro on my iBook. I used the waveform monitor available in FCP's "Log and Capture" mode to insure the chart was evenly lit and to analyze the luminance levels being read by the camera. 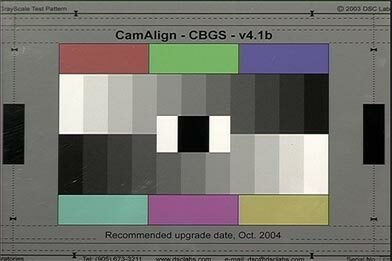 Using the camera's linear CINE gamma setting and the waveform monitor, I optimized the latitude of the camera by exposing the white chips on the chart to read right around 100 IRE. I then dialed down the camera's MASTER PEDESTAL to -9, the point at which the blacks hit 0 IRE without crushing. Note: The black levels of the chart maintain reflective properties. Measured against non-reflective "cavity black" material, black levels are actually several IRE units lower. While this test was done using the chart's black levels as a reference, it should be noted that they don't reflect (no pun intended) the blackest black. Setting your master pedestal to the level I set for this test may result in unintentional crushing of the blacks. It's good practice, in any case, to avoid setting your blacks too low. It's better to keep them at a level that insures information in the shadows and you can always pull them down in post. The above chart shows the increase/decrease of chip luminance values in equal amounts. This is verified by the adjacent waveform reading that displays fairly evenly spaced luminance values with the crossover (the middle gray chip shared as a common value between the upper and lower row of chips) just a smidge higher than 50 IRE or true middle gray. This is a 1-stop difference from f8 to f5.6! The whole upper range of the camera has disappeared into oblivion. Where you count 5 distinct steps with detail from middle gray into white on the NORMAL chart, this chart displays 3 distinct steps and the 3rd step doesn't hold any information aside from pure white. Middle gray jumped over 10 IRE and while the darkest black struggles to maintain its roots, the shadow range is pulled up and going milky. If there's any saving grace, it's that the colors, while a little washed out, are significantly more vibrant in this overexposed chart than the NORMAL chart. Fuhgedaboudit. Middle gray approaches the highlight limit at roughly 95 IRE. The blacks do an admirable job of hanging in there, but can't help going skim. Here's where it gets interesting. This chart was exposed one stop under from f8 to f11. Rather than dunking a quarter of the image into pure black the way the overexposed chart turned over the highlights to pure white, this chart maintains distinct separation between every chip throughout the scale. Highlight detail is compressed and the overall image loses contrast, but there's something to work with. All is not lost! The image is murky. There are no highlights to give sparkle and presence. The deepest shadows are blending together into a black void, but it's still all there! Sure, the blackest black is crushed into nothingness, but you can still see separation between every chip on the chart and you can count every single chip on the waveform monitor. The 2 stops overexposed chart gave us 7 out of 11 steps of separation. This chart gives us 11 out of 11 steps. This is the chart I plotted based on pixel sampling from the video captured chip chart. It gives a quick visual reference as to the behavior of over and underexposed video. I'd love to hear your feedback. Shoot me an e-mail at infoNOSPAM@dancoplan.com (remove 'NOSPAM' from the e-mail address). * I used a Panasonic DVX-100 video camera for this testing. If you're interested in finding out how this camera employs different gamma settings, check out my article, "DVX-100 Gamma Settings". This article was originally published at DanCoplan.com and is reprinted here with permission.